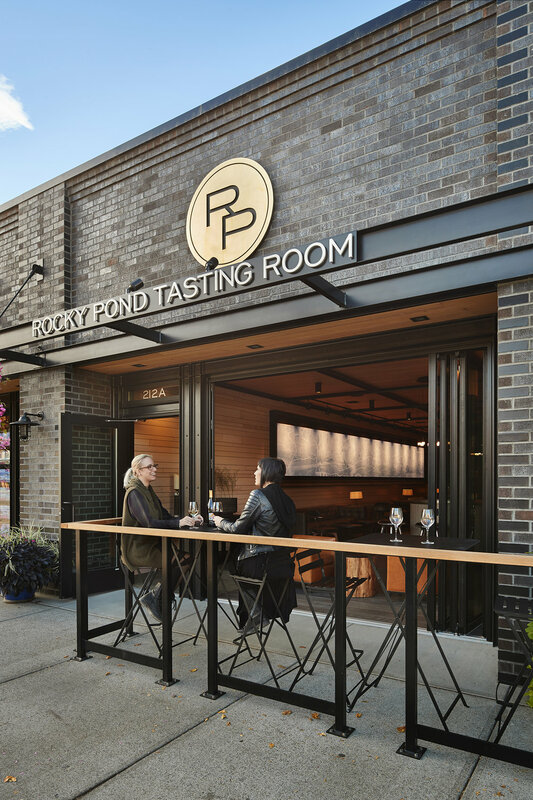 Located in downtown Chelan, Rocky Pond Winery is designed to bring a heightened sense of awareness to the winery’s story and their wines. The 2,000-square-foot tasting room serves as a sophisticated venue in which to relax and celebrate the experience of wine, while staying true to the humble, agricultural surroundings of the area. Reworking a speculative retail space, the existing facade was transformed via a new, fully openable storefront system, merging a small, semi-enclosed exterior patio with the inside. The owners’ interest in focusing on the experience of wine finds its expression in the casual seating arrangements, and the subtle, natural materials and hues used to build out the space. Defining the space is the forty-foot-long, custom-fabricated, pewter-topped tasting bar, which is set atop a whitewashed pine base. 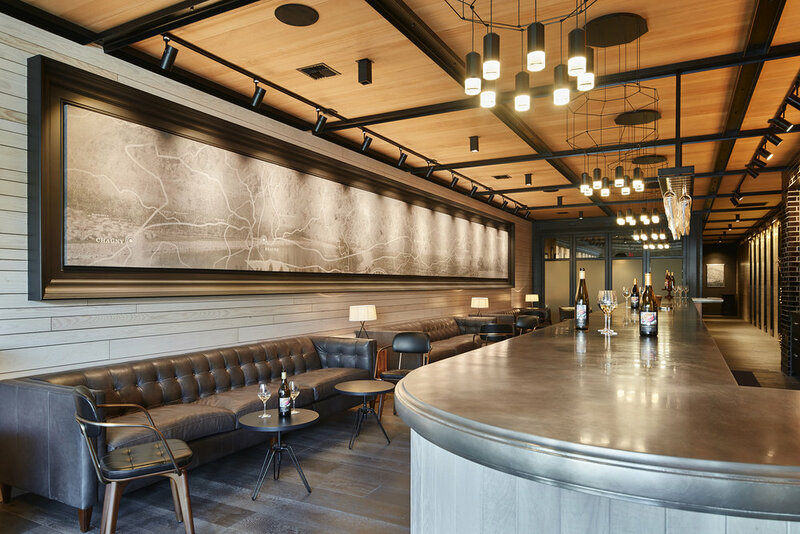 Opposite the bar, a forty-foot-long art piece designed by the architects merges cartographic imagery of Burgundy with photographic imagery of Rocky Pond vineyards. The piece serves as an homage to the owners’ wine tasting bike trip through France that served as the inspiration for the winery. Neutral tones take precedence, with whitewashed pine used for wall surfaces, whitewashed oak for flooring, and natural fir for ceiling surfaces. Bar cabinetry is a mix of white oak and dark paint. A small, private tasting and dining area can be created through the use of a set of folding walls, which can isolate a portion of the space. Lighting and C-channel ceiling divisions are blackened to provide a visual contrast to the natural tones that otherwise dominate. A small catering kitchen, restroom, and basement storage area round out the back-of-house areas. A set of vitrines inset into the wall next to the private tasting area showcase a cross-section of earth and vines taken from selected Rocky Pond vineyards. Each vitrine highlights the varying grape vines and soil compositions found in the winery’s vineyards. The exhibit serves as a reminder of the natural processes needed to transform grapes into wine as well as a way to educate guests about the soils and climate that make Rocky Pond wines so special.